It’s been a great year. We’ve had a lot of cool new tech toys and some really interesting business events. The number of people who come here has doubled since last year. My wife Cindi still can’t believe that many people care what I think. Here are the 10 more popular posts of 2007. Thank you all for your support and feedback. I wish you all a safe and wonderful New Year. Unless a change is announced you only have one more day to Give One to Get One. 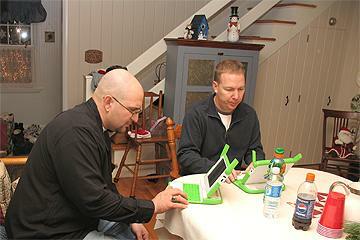 The OLPC Foundation created the G1G1 program to seed interested U.S. XO laptop buyers and supporters. It was a good decision. Originally, this program was due to end in November but its popularity allowed it to be extended under December 31st. Will it be extended again? I can’t say but if you’d like to participate I wouldn’t risk it. This is a non-profit foundation so if it is extended it won’t be for the sake of profit. If anything I could see the OLPC Foundation making laptops available to prevent a black market in XO laptops that might prevent them from getting to the kids. Already, we’re seeing scumbags trying to sell XO laptops on eBay at inflated prices. So if you have $400 cash left over after the holidays you have an opportunity to do something good and be a part of a growing community of new XO laptop users. Just go to http://laptopgiving.org/en/give-one-get-one.php but don’t wait long. Earlier this month I started to see an increase in requests for a file name Winter.exe. I didn't have a good feeling about this filename and our follow up research proved I was correct. Our friend Temerc has a good write up on this infiltration at his forum, Temerc Internet Countermeasures. The other exe’s that appear to be included are infos.exe, autos.exe and a few randomly created filename. Fortunately, they all show up in WinPatrols’ startup programs list. The filename bronto.dll showed up in our IE Helpers list. Google has done a good job at making it easy for people to create Blogs, but in many ways, it’s too easy. A huge number of Google Blogspot, blogs are being created and have become host sites for this file and other malicious programs. I wrote earlier his month that Spamhaus was blocking any Email which included a Google blog in the content of the message. This was a dramatic step but has proved to be necessary. A link to the Blog is included in a teaser Email. The blog might show up in a typical Google search. You click on the “Next” button on a Blogspot site. Our friends at SunbeltBlog have also written about this topic and show how easy it can be to run across these blog traps. Alex at Sunbelt provided some good screen shots and stresses how video “codec” scams are frequently used as an malware entry point. If you see a message that says “You need to download new version of Video ActiveX Object to play this video file”, run away! Don't press cancel or even trust the red close box in the corner. Press Ctrl-Alt-Del and look at your list of processes. Select your browser( iexplore.exe or firefox.exe) and click on End Process. Christmas day at the Pytlovany house was very special and included no less than 25 family members of all ages. There were new babies, new clothes and naturally new toys. Except for my new XO laptop, nobody I know received a new computer or laptop this Christmas. I take that as a bad sign for the computer industry. It used to be that new versions of Windows generated new computer sales but there hasn’t been a lot of excitement around Vista. John and Jim exploring the new XO laptop. Our big present this year was SmartParts 15” Digital Picture Frame . I have used and reviewed other digital picture frames and wasn’t expecting to be this impressed. I love it and even though it’s from a company I had never heard of. I’m happy to say the picture quality is awesome. The interface is easy and while I’m not sure I’ll use the feature, it will play audio and video files from what ever flash media you use. 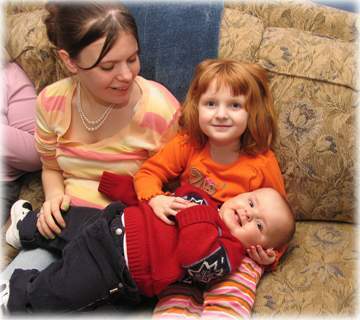 The Nintendo DS Lite was still popular but the big kids were really excited about the Sony PSP . We already have a Wii which I have written about before. GPS Units were very popular with the adults. I really want one myself so I’m anxious to hear back which one works the best. Santa gave one of my other favorites to my granddaughter Marisa. She’s been spending a lot of time playing with her new iTouch. I might get one when they expand the memory. She also received a lot of iTune gift cards which must be used in the country they were purchased. We’ll be doing a lot of downloading before she returns to Germany next week. Click on “Comments” below and share information on your favorite new toy. Over the last week my new XO laptops have monopolized much of my time and postings here at Bits From Bill. I realize that not everyone is interested in the OLPC XO Laptop so I’ve created a new site called XO Activity. If you are interested in learning more I’ll be documenting my adventures and sharing what I learn. My first new post today will help XO user find new games and other XO Activities. Thank you for your patience. Next week I’ll be back posting about auto updates, spyware, adware, spam and ranting about other more useful technical information. My new XO Laptop is proving to be very controversial. People seem to either love it or hate it. If you’ve never heard of it you’re not alone but you’ll be hearing more. If you’re sick of me writing about it I promise to cover other topics soon. The target audience for this laptop is not the typical computer geek but we’re all giving one to get one so we can play and learn more. Almost everything about this laptop is new and the excitement I feel is reminiscent of my old Commodore days. The user interface for the XO is called “Sugar”. Instead of programs or applications, the XO Laptop has “Activities”. 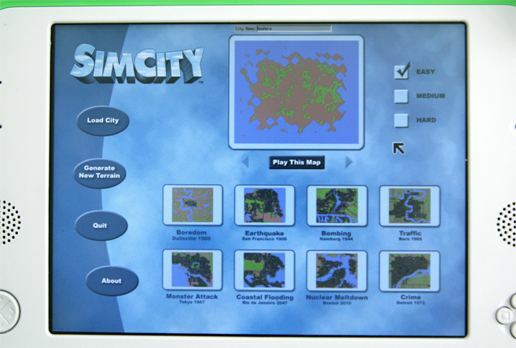 Most Activities are designed to be used in a share mode. Instead of a Desktop you’ll be “Home” when the laptop starts. Your Home lets you switch between Activies. Like the computers I grew up with, only one Activity will run at a time. Your Local network of friends is called your “Group”. In a classroom environment you’ll see your classmates and can create a buddy list and/or participate in a group bulletin board. The more familiar “Neighborhood” will show your available Networks. Along the top the Places you can access are Neighborhood, Group, Home, and Activity. 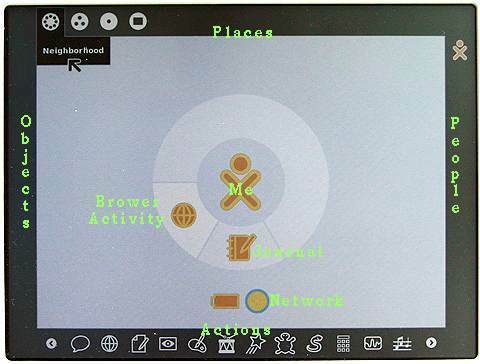 When you move the cursor into any “hot” corners, the “Frame” will appear and provide an interface to “zoom” to your Places, People, Objects and the “Activity” launcher. Move the cursor back off the frame and it will disappear. There’s also a Frame key in the upper right corner to toggle it back and forth. Most data items in your Activities may be stored in the XO clipboard as an Object. Multiple objects can be stored in the clipboard and hey will be displayed on the left side of the screen. On the right side of the screen you’ll see other People you can share with on the Mesh network. While many user interface elements are completely new you’ll find some familiar computer concepts. For instance, Delete and Backspace have been combined into “Erase” which operates like the traditional backspace. Clipboard concepts like Select All and Cut,Copy,Paste are available and so are the familiar shortcut keys of Ctrl+A,X,C,V. You’ll want to know how to use Home, End, Page Up and Down. Hold down the function key and press the arrow key. Like legacy computers holding down the shift will select the text. For all the Linux fans out there with good eyesight here’s what you’re looking for. You can access the Linux command line. by holding down Ctrl+Alt+Fn and press 1. When asked for a Login name, type “root”. To return to the Sugar User Interface hold down Ctrl+Alt+Fn and press 3. I’ve been getting a lot of questions about my new OLPC so I expect to write a lot about my experience with this new XO Laptop. I doubt I’ll be the only one writing about this unique device. Rule 1: Forget everything you already know. The target user for this laptop are kids who have never been exposed to a computer before. You’ll need to look at using this computer as if you’ve never used Windows, Mac or even a C64 before. That means forget about double clicking by tapping on the touch pad. The position of OK and Cancel buttons won’t match the Windows interface. You shouldn’t expect File/Edit drop down menus. Instead of Save, you’ll “Keep” your data and access it from your journal. Forget any concept of a folder based file system. In theory, the kids won’t ever know the market value of the OLPC laptop. It was supposed to be the $100 laptop but that price will have to wait. If you Give One to Get One, you are making a donation. 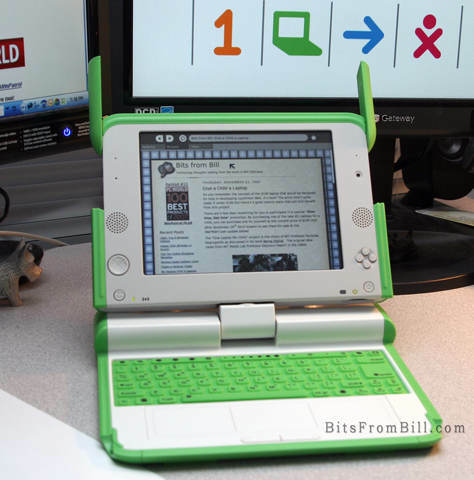 Don’t expect your OLPC laptop to be anything more than a conversation piece or toy. I had thought I could spend a couple days to evaluate the OLPC. I was really wrong. I keep learning more and more and there’s no way I can do justice to this machine until I spend at least a month with it. Nobody should publish any review for this laptop until at least next year. Tristan playing with the photo/video/audio application. My first impression was disappointment but that’s already starting to change. The interface is different which is ok and expected. Unfortunately, it’s fragmented. It tries to be different but still tries to teach computer skills. I think there’s always been a gap between academia and real world. What sounds good in some white paper may not convert well to a real product(::cough:: Ada). Profit is sometimes the best motivation in the creation of great products. Earlier this month John C. Dvorak wrote an article suggesting it might be better to just give $200 worth of food. John was just being a cranky greek and I still disagree. Giving this laptop is an investment and while risky it’s worth a shot. It’s not like it could hurt America’s image any more than the Bush Admistration has already done. Applications are plentiful: It even includes a number of programming examples for kids to learn how to create their own programs. Size: It’s small for kids hands. Networking: It took a little practice but it now always finds my WiFi network and searches for any available Mesh networks. No power crank: I thought this was the whole point. Durability: I expected it to be a little more ruggedized. Bugs: I’ve had my share of reboots and mouse weirdness. I can’t say if it’s hard,soft or firmware related. No Popups: Some web apps actually use pop ups. Sound quality: The quality is similiar to my old C64 but the speaker isn’t as good. Seems like MOS Technology’s SID chip could gotten cheaply. One thing for sure, there is a huge need for some instruction books along with tips and tricks. I have to wonder if David Pogue is already working on “OLPC: The Missing Manual”. 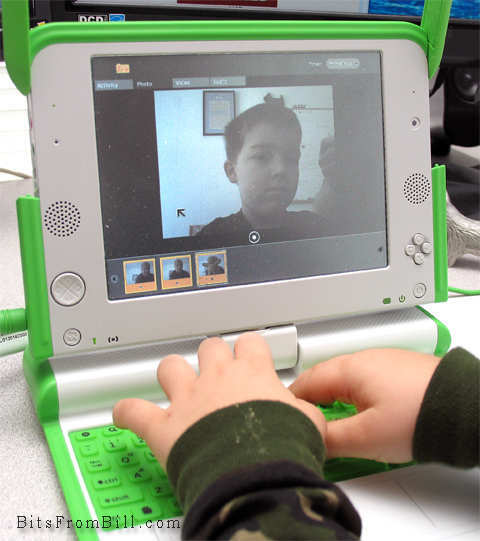 Update: I spoke with David and we won't be seeing a book from him but Edward Cherlin directed me to OLPC help available at http://wiki.laptop.org/go/OLPC_Publications. Edward also was kind enough to address my dislikes in the comments section below. I received an early gift from Santa today and it looks like I’ll be snowed in all weekend so I’ll have plenty of time to play. It doesn’t come with manuals but after a little exploring I’m now connected to my WiFi network and surfing my favorite web sites. OLPC stands for “One Laptop Per Child” and this is my half of the “Give One, Get One” program from the makers of this unique device. You may also hear it called the XO Laptop. I really didn’t expect to receive my laptop so soon. Perhaps the folks trying to get out all the Nintendo Wii’s for Christmas could take a lesson from the OLPC Foundation. I have a 2nd laptop coming so I can play with the wireless mesh network which is integrated into the machine and ideal for classroom usage. As a developer I’m looking forward to creating something useful to do my part. I’ll be writing more but for now I just wanted to let folks know they’re real and they really work. If you participated in this program hopefully yours may be arriving soon. My only problem so far is, I keep trying to tap on the touch pad to select which isn’t supported. You have to click the left button. I also took note of my Blog stats to see how accessing web sites is recorded. I love that when I travel I can get online from just about anywhere. High speed WiFi networks are now available in most hotels and airports of the world. This is a big change from when I used to bring wire strippers, electrical tape and a screw driver when traveling. In my old Q-Link days hotels didn’t even have modular jacks so I used to unscrew the phone jack to wire up my 300 baud modem. Unfortunately, WiFi public networks can be a real danger to your privacy and the security of your computer. 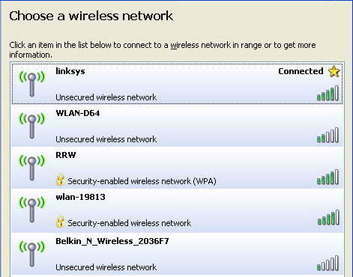 If you’re connecting to an unsecured WiFi network your data is up for grabs to anyone with the right tools. Keystrokes, Emails and passwords on unsecure web pages can be grabbed out of the air. What you also need to watch for is bogus WiFi networks that phish for your connection. One of the guys at VirusList.com recently blogged, while sitting at Schiphol Airport in Amsterdam, that his computer found suspicious networks with names like “Free Public WiFi” and “US Airways Free WiFi”. Just driving around my neighborhood I was able to find a number of wireless networks open to the public. At a hotel or airport you’ll see many others including some with the word “FREE” in their name. Beware! If it’s an AD-Hoc network you should see the words, “Computer-to-Computer” under the network name. 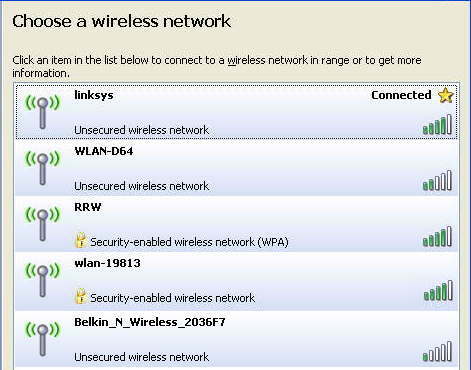 The ones shown in my example are Access Point networks. Most of you don’t have or probably don’t know what a VPN is so I’ll offer you an alternative. I use a service from GoToMyPC.com. Using GoToMyPC when I travel, I connect to my home/office PC. I open up my Outlook Email as if I was sitting in my chair at home. It also means I don’t have to sync up stuff I’m working on when I leave and return. I even sign on AOL from that computer via GoToMyPC. Essentially my laptop acts as a dump terminal and the entire session is done using 128–bit AES encryption. The service is $20 a month but you can click here for a free trial. If you’re a regular reader you’ll remember I recently changed from Time Warner Road Runner to Verizon FIOS which provides much greater upload speed. Many broadband providers give you lots of download bandwidth but a small slice for upload. Having more bandwidth allocated to upload is especially helpful for using GoToMyPC. Like many others, I’ve always included a link to my Blog in my Email signature. Apparently, it’s not always a good idea. If you’re a Blogger who uses BlogSpot (and you include a link in your signature) some folks may never see your Email. I recently tried to respond to a friend at Harvard’s Berkman Center for Internet and Society only to have my Email bounce back. Apparently, my blog is listed on the Spamhaus Block List. I wrote to Spamhaus and received the following reply. Harvard is trying to protect their users from the tens of thousands of blogspot.com URL's set up by spammers in just the past month. We advise all users to consider emails with blogspot.com links in them as probably spam. Your emails include your non-spam blogspot URL. Sadly, on the same IP address is the tens of thousands of spammer URLs. Until Blogspot (Google) can come up with a solution to the abuse, we'd advise you to use tinyurl.com or easyurl.com to "mask" your blogspot.com link when included in emails. I personally think Spamhaus is being a little heavy handed but that’s why I don’t use any auto spam filter. By the time I publish this, HerbalKing and other spammers may be including Tinyurl links in their spam. This could potentially kill Tinyurl. Luckily, I recently registered “BitsFromBill.com” and can use that domain to redirect folks to my Blog. This may not be an option for other BlogSpot/Blogger.com users so you may want to review how you sign your Email. Don't forget to Give but when you do, Give Wisely. It’s the time of year when you’ll start to see some real and some illegitimate organizations asking for donations. While we’re all in the holiday spirit and the credit card is close at hand it’s a good time for fund raising. I knew it was time as soon as I started to receive bogus invitations for have letters from Santa sent to my kids. Yea, like I want to give anyone a kids Email address. In general, I reject any requests that come via my phone or in my Email. I often give to those in need, both organized and personal but I don’t need to be reminded. I certainly don’t want unrequested Emails added to all my spam. Chances are high that charity Emails you get this month are not to be opened. I hate to say but even some seeming reputable charities may not be spending your donation in a way you’d want. There are a number of web sites including “Charity Navigator” that will rate charities and provide details on how funds are utilized. I was pleased to see that the “Marine Toys for Tots Foundation” received a 4 star rating. Only 2.5% is used for non-program expenses. Our local “Animal Protection Foundation” in Scotia, NY also received fours stars. Unfortunately, I noticed the Northeast Animal Shelter only received one star and only 52% of the funds go to programs. About 8% goes to administration and 40% is spent on fund raising expenses like advertising on Google. The Computer History Museum in Mountain View, CA is having a special celebration on Monday, December 10th. Invited speakers include former CBM president Jack Tremial, Apple pioneer Steve Wozniack, Amiga developer Adam Chowaniec and William C Lowe, father of the IBM PC. I’m sure my invitation was lost in the mail. Let me just say that the C64 changed my life like no other device. It was like a drug that addicted me with its charm and personality. It helped me find new love, friendship, travel and a completely fun new career. Call me sentimental but it allowed me to find confidence and purpose in my life. I had become quite the advocate of the C64/128 when I met up with a guy named Steve Case and his friend Marc Seriff. We shared a vision that personal telecommunications could be so much easier. I won’t bore you with sorted details of my C64 history but I’ll share some of my favorite tricks and memories that might be interesting to other C64 users. I used to bring my Commodore Vic-20 with me into my chemistry lab in college. Instead of spending one hour studying the lab work the night before, I would spend three hours writing a program to input and process my lab results. I thought my professor would be impressed but he was more excited that I could make the computer duplicate the sound of a phone ringing. Unlike other computers of the time, the Commodore 1541 floppy disk drive had a processor and memory which allowed it to be programmed as well. While this was typically used for copy protection, someone actually wrote a program that made the disk drive play the tune “Bicycle Built for Two” by moving the drive head back and forth at different frequencies. It was a cute trick but not one I demo’d very often. My favorite trick was created by programmer, Michael J Henry. It was easy to customize the text in programs by editing characters on the floppy disk so you could make the screen say anything. Well, Michael’s trick discouraged people from removing his name on the screen. The “L” in his first name was represented as “4C” which in the machine language of the C64 was also the code for the instruction JMP or Jump to the address of the next two bytes. At startup, his program would jump to the physical screen address where the “L” was visible and it would cause the program execution to jump to the address “204A” which was represented by the “space J” in his name. If anyone changed his name, the program stopped working. If you were able to follow that you can claim geek status. One person missing from Mondays’ event will be my old friend and mentor Jim Butterfield. In doing research for today’s post I discovered that Jim passed away peacefully June 29th of this year. I ran into a great article on CNet today that was nostalgic for me but might be of interest many of you as well. 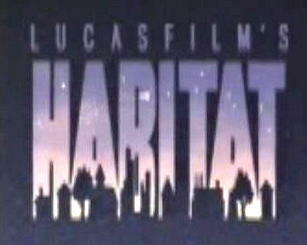 Many years ago I worked on a project called Habitat in a partnership with Lucasfilm LTD. One of the benefits of the project included visits to Skywalker Ranch, just north of the San Francisco. It was a quiet year for the ranch. No new Star War movies were planned and the most recent feature film had been Howard the Duck. CNet’s Daniel Terdiman reported on his recent trip to Skywalker Ranch and was allowed to take and publish a number of photos. I used to backup my data to CDs, then DVD’s but now with the low cost of solid state memory I’m actually archiving data on postage stamp sized 2 GB cards. Secure Digital Flash memory is also becoming the most popular storage for camera’s, PDA’s, mobile phones and Audio players. Unfortunately, if you’ve been shopping for SD cards you’ll easily be confused about which one to purchase. For instance Kingston has Secure Digital, Secure Digital Elite Pro, Secure Digital Ultimate and Secure Digital High Capacity. SanDisk has its standard SD memory, Ultra II, and SD Extreme III. Below are current rates from Amazon. Read/Write are maximum speed when no fragmentation of data blocks is found. Sometimes speed is measured in 66x or 133x. x = the standard CD-Rom speed of 150kb/s. Speed is measured by class which is the minimum data rate even with fragmentation. In theory these cards could grow to 128 GBs although 8 GB is most currently available. While the higher capacity SD cards are typically formatted with the FAT32 file system that isn’t the difference between SD and SDHC. SDHC uses SD protocol 2.0 to store data blocks. You might think price equals quality and speed but it’s a little more complicated. Many camera’s and other devices won’t support the larger SD cards. Many card readers don’t support the new SDHC format for cards over 2 GB. For instance, our grandson is getting a Kid-Tough Digital Camera from Fisher Price which doesn’t support “high speed” SD or cards greater than 1 GB. The Nintendo Wii only supports up to 2 GB. Some devices may support new protocols if their firmware is updated. Not every store includes this very useful information in their product description. One of the cool things about the SD type memory is its SDIO expandability. This allow devices to be built along with the card including wireless, cameras, GPS, fingerprint recognition and much more. I recently wrote about the Eye-Fi SD card which uses this functionality. The big question for me is how many times can the memory be written to, and how long with it last? This information isn’t easy to find. The industry claims this kind of memory( NAND) can be written to up to 100,000 times and operate up to 51 years. My research concludes that SD memory should last up to 10 years when stored in a safe place. When purchasing SD cards make sure it’s compatible with your device and your SD reader and vise versa. When writing data to your SD card, be sure the operation is complete before removing the card from the reader. Over many years the focus of digital camera improvements have been price, pixels and speed. It’s all the same technology, just bigger, better and cheaper. The popularity of the digital camera has however spawned a welcome industry evolution in solid state memory cards. I’ve been snapping digital photos for over ten years and finally, I’m starting to see some real innovations. This is a natural progression and Eye-Fi just made it simple and cheap. Instead of each camera company building it into their camera, Eye-Fi has built it into the memory card. Eye-Fi even supports automatic upload to 20 photo sharing sites with more to come. For only $99, if your camera uses SD cards you’ll want to order one of these before supplies run out. It may not be available for all cameras but if Sirf has its way it will be soon. Your camera currently records the date and time you take your photo. How nice would it be to know exactly where you were when the photo was taken? In my opinion this isn’t any kind of brilliant idea, it’s a natural convergence of technology. The GPS network is there and available, why shouldn’t your camera use it. What would really be really cool is if they could just build GPS functionality into the Eye-Fi card.